See how we can demonstrate the savings on login times, storage costs and much more. Ready to see what WebData Control can do for you? Fill in the short form and we'll show you the software in action. Recently we’ve been working with several Ivanti UWM customers to understand what impact personalizing the various web browsers is having on their environment. As part of these engagements, we have created a series of scripts which can be executed against the Environment Manager Personalization SQL database to see how much browser data is being stored. The scripts support both Windows Settings Groups and Application Groups and will work with any version from Environment Manager 8.6 and above. These scripts provide an understanding of how roaming web data will be impacting your environment. They provide an overview of all the web data that is being stored within your Personalization server database as well as the additional data for the associated archives. The size and volume of this data is relevant to the users’ logon experience as retrieving large files or a large number of individual files from a network resource will have a negative impact on user logon duration. This data will also be impacting any archiving and maintenance routines that are scheduled to run in the environment as well as those related to SQL database backups. This data will also be consuming unnecessary SQL Server resources, and reducing SQL Server performance. We hope you find them useful and they help you assess your environments. Cookie Management: Shouldn’t the government be setting an example? Windows 10 Project - The Bits You Didn't Know! Google Chrome And It's Magic Trick! Do You Want to Save Your Password for This Website? 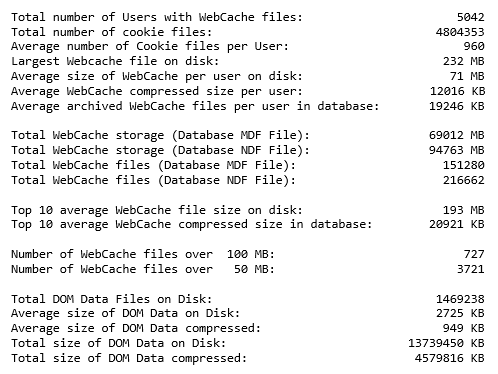 Contents of the WebCache – What you didn’t know. When does 25 equal 300? Are all Webcache files equal? Short answer no! But as always with these things it is not that simple.